Yay for dots! I'm entering this in Rebecca Likes Nails contest. Check it out and see if you'd like to enter. I love dots and I can't wait for my dotting tools to arrive! That's so cute! Those yellow dots are massive!! :} Love it. Cute! Good Luck in the contest! SOOO cute!!! :'D Great luck on the contest!! Yay for dots! 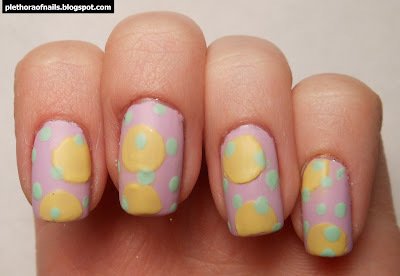 Love these colors together, it is very Eastery! Good luck in the contest! So cute!! And I love Sweet Hook!